Formerly penniless and without possessions, Narconon graduate enjoys new found riches this holiday season. I am able to deal with my 16 year old boy when he gets into trouble. If I were still on drugs, I would just let him go – I wouldn't have been able to deal with him." John never kept track of holidays and didn't even know when it was Thanksgiving, Christmas or New Years – they were all just another day to use drugs. That was before Narconon drug rehab. This Thanksgiving he will be delivering dinner to 1500 homeless and will be home in time to cook Thanksgiving Dinner for his elderly parents. John won't be scrimping when it comes to getting Christmas gifts for his family. While many families have had to deal with a layoff, since his graduation from the Narconon program 4 years ago, John has prospered and this year with Christmas music, Christmas Recipes, Christmas Cookies he finally has a taste of the life he could only have dreamed of. Before drug treatment John had lost all his possessions to drugs abuse. Anything he had, he traded for drugs. 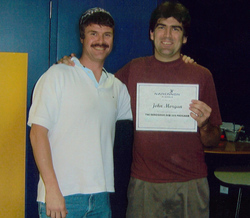 Upon arriving home after graduation from Narconon, though penniless, John discovered he was much more focused and enthused about life. He started to put all the life skills he had learned in the Narconon program to work and now has a management position in a 5 chain store. Not only that, leading by example, he has gotten 6 others in his company through the Narconon program and runs a virtually drug free company. Though drugs are problematic in South Carolina, John has created a drug free haven around himself. "I use what I learned in the program everyday", states John. "I keep my books in the car and if my mind starts to go in different directions, I pull out my books and study. This puts things back into perspective. If I start to go downhill at all, I can reverse it right away and I pop back up." John enjoys kayaking, dirt bike riding and other hobbies that he could not afford as a drug addict. He plans on getting married this year and has adopted the two children of his fiancé, a responsibility he could not have faced while on drugs. He got his step daughter through high school last year and is concentrating on his adopted son. "I am able to deal with my 16 year old boy when he gets into trouble. If I were still on drugs, I would just let him go – I wouldn't have been able to deal with him." "Since I have graduated from the program I really have some holiday fun with family and friends, whereas before I would just sit in the house. It is really about family now for me and I wish others could experience the joy I have. I would love a world without drug addiction. I imagine that it would be a world where people cared about each other. Right now, we need to help those we can and get them to Narconon."